For relief from bustle and crowd, you can retreat to a resort in Hokkaido. Here are some things to let you know before you make an itinerary. The one is that Hokkaido is the largest prefecture in Japan and the travel distance between cities in Hokkaido is always much longer than it in other regions of Japan. Hokkaido Prefecture, situated in the north of Japan, is the island with an area of 83,450 square millimeters, equivalent to one-fifth (20%) of Japan's total land area. 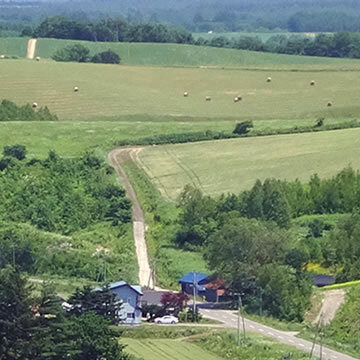 Since the early settlers had cultivated the land under the guidance by European and American instructors, Hokkaido is somewhat different from other parts of Japan and the cultural landscape has a European atmosphere. 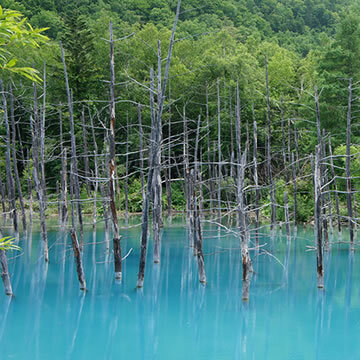 Blessed with nature, there are many outdoor activities to enjoy in Hokkaido, include hiking, bushwalking, kayaking, skiing, outing in nature, Onsen soaking and viewing the magnificent landscape of the countryside. 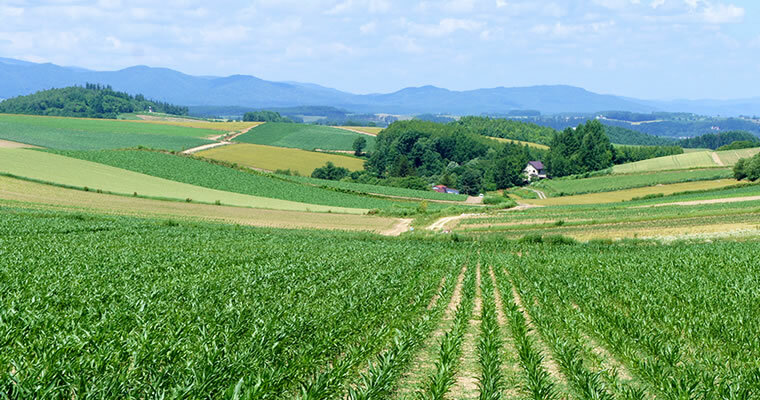 Hokkaido also boasts local seafood dishes, Ramen, Sushi, and dairy products including cheese, sausages and ice creams. 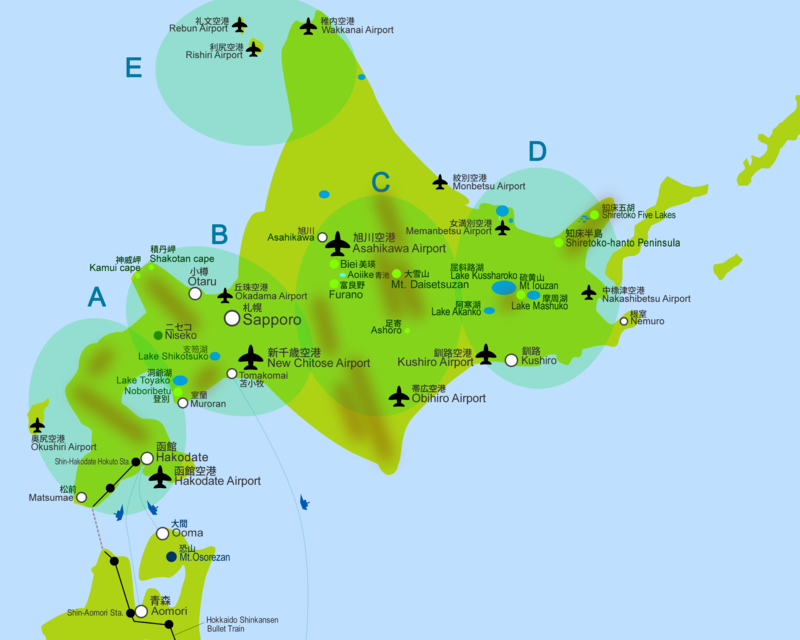 Hokkaido has thirteen airports. Daily scheduled flights between Tokyo and Hokkaido are frequently operated from/to New Chitose Airport 新千歳空港, Asahikawa Airport 旭川空港, Hakodate Airport 函館空港 and Kushiro Airport 釧路空港. Deciding which airport to land depends on your destination. 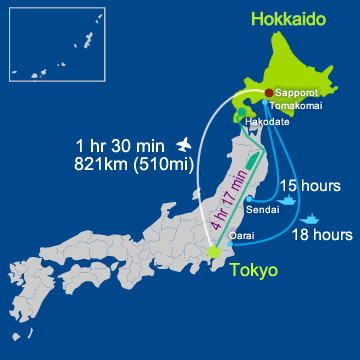 For a rule of thumb, it is a 35-min flight between Sapporo and Hakodate, the major cities in Hokkaido. Flights are also available between other major cities in Japan, such as Osaka and Aichi. International flights are operated between cities in Taiwan, Australia, Korea, China Guam etc..
Japan’s mainland and Hokkaido Island has been linked by an undersea tunnel where the bullet train “Hokkaido Shinkansen” runs, allowing passengers to travel between Tokyo (Tokyo Station) 東京駅 and Hakodate (Shin Hakodate Hokuto Station 新函館北斗駅) for 4 hours and 17 minutes without changing trains. Getting by car may be suitable for group tours. In the case of getting to Hokkaido from Tokyo by car, it takes at least 17 or 18 hours, and the highway tolls will cost a lot. Besides you need to go over the sea between the mainland and Hokkaido Island by ferry. The undersea tunnel is only for trains. The travel time between Aomori and Hakodate is about 1 hour 30 min. The fare is from 2,220 JP Yen up to 17,730 depending on the season and the class. The vehicle fare is from 13,160 up to 23,660 JP Yen, depending on the travel season and the size of the vehicle. People who want to go by one’s car from Tokyo to Hokkaido often take this route, which is to get to Oarai Port in Ibaraki prefecture by car, then take a ferry for Tomakomai in Hokkaido with one’s car on board. The fare is from 8,740 JP Yen up to 44,230 depending on the season and the class. The vehicle fare is from 26,740 up to 46,290 JP Yen, depending on the travel season and the size of the vehicle. The travel time is about 18 hours. For those wanting to save money for accommodation, taking a ferry is a good option. The cheapest fee is only 8,740 Yen, though it takes 18 hours. 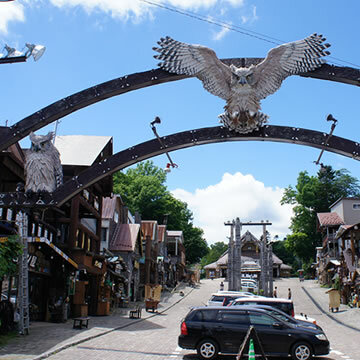 Finding places to visit in Hokkaido is not difficult as numerous tourist spots are mentioned in many guidebooks. What you should keep in mind is that Hokkaido prefecture (Hokkaido Island) is much larger than other countries on Japan’s mainland. You should always expect longer travel distances between cities than those in other prefectures in Japan. For example, The distance between Hakodate and Sapporo is about 300km(187mi), a 4-hour ride by car in the case of using a toll road. It takes more than 6 hours if you take a toll-free road. So, the areas A.B.C D and E om the map zoned by the maximum distance you may travel within one or two days will give you a clue to make your travel plan. It is recommended that you have at least 2 or 3 night stays to enjoy your trip - traveling in area C on the first day, D on the second day, for example. There are scenic drives around Biei, near Asahikawa Airport. 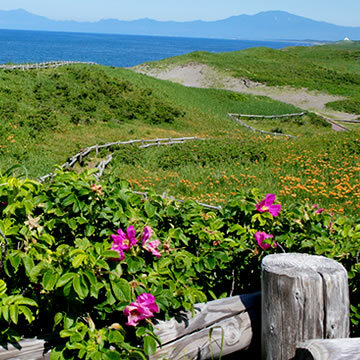 Exploring Shiretoko is the highlight of summer activities in Hokkaido. Since tourist spots are scattered around and most of them are rather far from train stations, independent tourists like to use a rental car. 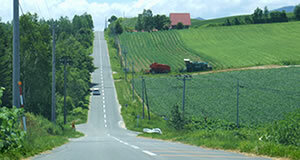 In fact, the exhilarating driving along scenic roads is an attraction in Hokkaido. Thanks that Hokkaido has only a few toll roads. For those who don't drive a car, joining a tour or an excursion may be a good option. For public transport the bus is served only every one hour or less in the most of the areas. Using a taxi should be only within a city, like getting to a hotel from airport. Finding hotels is easy in cities such as Sapporo, Hakodate and Asahikawa, but it is not in other places. There are towns having only one or two hotels, some have no accommodation facilities. 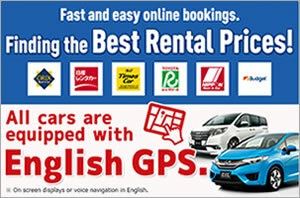 Therefore, making an itinerary and a prior booking is always necessary. Budget hotels and Japanese inns can be found at small Onsen hot spring resort towns. Hokkaido actually has a number of Onsen hot springs towns. In Sapporo, in winter, a large snow festival is held around the beginning of February for one week. Be sure to make a hotel booking in advance, as early as possible, if you visit Sapporo during the time as all hotels in Sapporo will be fully occupied. Some travel agencies offer flight and hotel packages which allow you to save money for your budget. The information about these packages is usually available only in Japanese. It may be well worth considering if you understand Japanese. 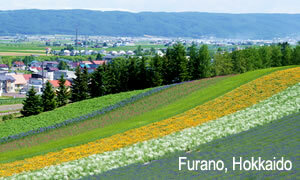 Aoiike lies in the off-the-beaten-track near Biei and Furano. 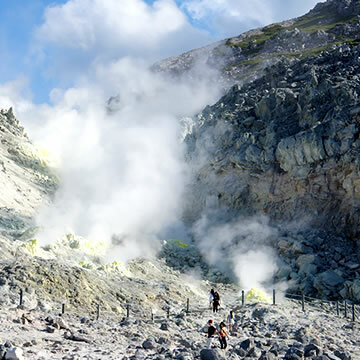 Mt.Iouzan is also called Atosanupuri, in Ainu natives language. The mountain lies between Lake Akanko and Lake Mashu. Ainukotan Town at Lake Akanko. Ainu are an indigenous people of Hokkaido. 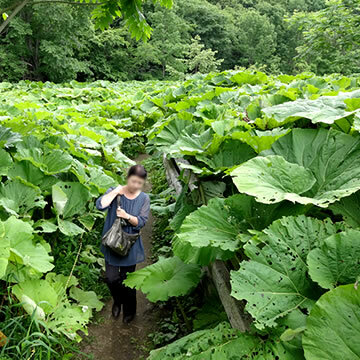 The giant plant "Rawanbuki " in Ashoro town gives you a sensation of being the Hobbit. In winter it gets extremely cold in Hokkaido if compared to Tokyo. The average temperature in January is -3.6C in Sapporo, -5.9C in Shiretoko, and 5.2C in Tokyo. Staying in Hokkaido actually is not much uncomfortable as most buildings have a central heater. What you have to keep in mind on your trip is to be careful when driving a car on frozen/snowbound roads, not to let your car run out of fuel, and get to your accommodation before the Sun sets. The average temperature in summer (August) is, 22.3C in Sapporo, 20.8C in Shiretoko, and 26.4C in Tokyo. You may feel chilly in the evening if you stay in the Area D or E in the map. *Important: The local time of sunset/sunrise varies in seasons. In Sapporo, the Sun rises at 7:05 AM in January, 3:55AM in June. The Sun sets at 16:10(4:10PM) in January and 19:11(7:11PM) in June. In Tokyo, the Sun rises at 6:50 AM in January, 4:27AM in June. The Sun sets at 16:38(4:38PM) in January and 18:51(6:51PM) in June. In Hokkaido, cherry blossom or Sakura is at its best around the end of April. Watch out for bears. Do not go into any bushes or mountains in the national parks without a guide. Seico Mart, the convenience store chain, hardly seen in Tokyo, is so popular in Hokkaido that you will find one of the stores at many places, even in a small town. They offer unique local food sold only in Hokkaido.